There is nothing like adding to the chaos that is the Christmas season by doing a diy project in your house. Good timing on our part, right? Sure I wouldn't have chose this timing, but while dog sitting a week ago, a dog scratched up our bathroom and kind of lit a fire under us...well, really Ian, I could have lived with it for a bit. And it really is unfair of me to blame all of this on a dog. Just the timing is the dog's fault. Everything else is really bad quality by the people who flipped our house. The paint in the while house is pealing, so slowly we have been sanding and redoing everything. Maybe I should clarify, slowly Ian has been sanding and redoing everything while I take the kids out of the house. Now that demolition has begun and I have bathroom stuff mixed throughout my house like Christmas decorations, I am rethinking our timing a little. I can only hope things are complete by Christmas, but I am guessing it will more be the days after when Ian has some time off work. In the mean time, I am hoping Connor gets the hang of stepping over the shop vac because he is constantly managing to trip on the cord and make a ruckus when his sister is sleeping. And on a semi-related note, we ripped out the shower doors on the bathtub, which I am so excited about. Those doors are just not conducive to bathing children. Anyway, apparently the door tracks weren't calked on the inside of the shower. It makes me sick to think of the grossness that has been right next to my kids. I thought about posting a picture, but decided it wasn't necessary. 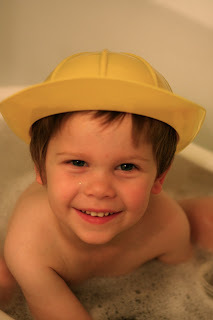 I decided you would prefer seeing a cute picture of my fireman in the bathtub, rather than the nasty mold that was surrounding my bath. i hope it all gets done in time! I just decided i'm going to have to put all my pinterest projects on hold. life is just too busy right now! 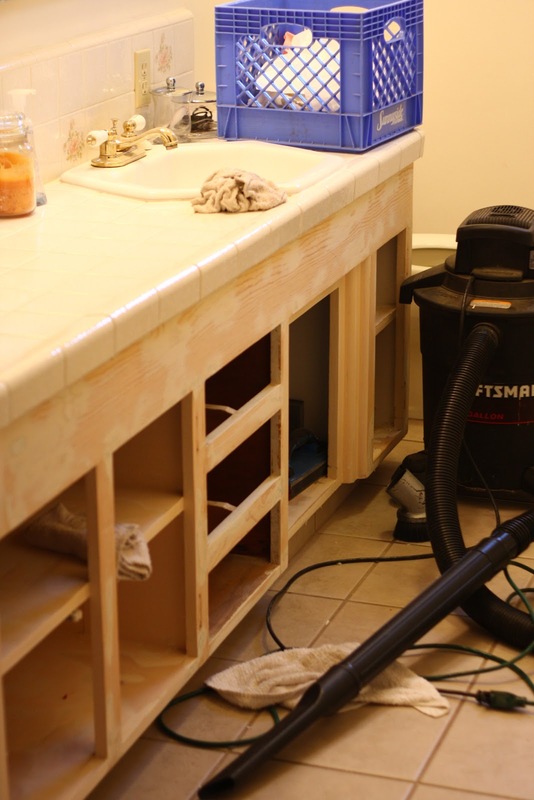 House DIY projects are frustrating, no matter the time of year! Good luck, and I hope it will all be finished quickly. Ugh, I hope the project goes by quickly. Sorry about the mess. I literally just stuffed my craft drawer full of all the unfinished project I had and said, "See you after the holidays!" It was too much.